We like Honda's LaneWatch camera system, but ultimately, it's not worth moving into a more expensive trim level. The rearview camera in the base Fit is good enough, given the car's great visibility. The 2016 Honda Fit isn't as entertaining to drive as it once was, but it's unmatched in safety and space, thanks to the Magic Seat. The 2016 Honda Fit is a five-door hatchback, the smallest Honda you can buy, and one of the best fuel-efficient cars on the road today. It isn't a hot hatchback, not a hybrid, not coupe-like at all—it's practically devoid of buzzwords. The Fit simply does what Honda has always done well, and it does many things better even than the last-generation car. It makes the best use of its small footprint. It's more appealing, outside and in. 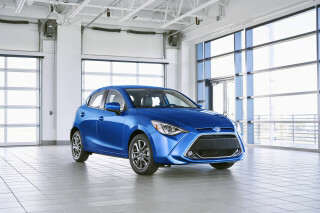 It earns the best crash-test scores of any small hatchback, not to mention exceptional fuel economy. The Fit sets the benchmarks for interior space, utility, and safety for small hatchbacks. It's not as entertaining to drive as it once was, and some minor fit and finish niggles could use some attention, but by a wide margin, it's our top choice in its class. 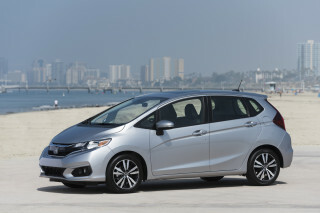 Pragmatic but attractive, the Fit isn't styled so much like a scaled-down minivan anymore. It's grown more toward the current state of the art in hatchbacks, with deep side creases, a shoulder line that accentuates the wedge in its shape, and a leaner, tauter stance. The stubby, short hood and long roofline draw out the longer body, and the glass areas are in better balance—as are the Fit's bigger wheels and tires. It all concludes at a rear end that's very much like a latter-day Volvo—if only it weren't for the big chrome bar across the tail. The restrained exterior could teach the interior a few things. The basic outlines are fine—the low dash opens up the cabin visually—but the Fit's dash is trimmed out in a lot of pieces. Bezels, surfaces, shapes, and trim textures—it all comes off OK, but a more uniform look with fewer cutlines would be a welcome upgrade. 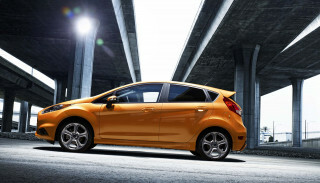 We've always thought of the Fit as the leader of the affordable-hatchback cause. It carries on that tradition in this generation, for the most part, though some of the eager feel of its steering and suspension tune have been muted. 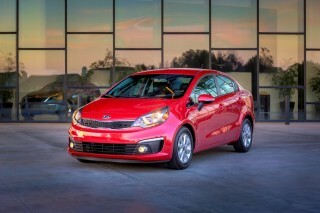 The latest Fit is powered by a direct-injected 1.5-liter inline-4 that produces 130 horsepower and 114 lb-ft of torque. A sweet-shifting 6-speed manual gearbox is the standard transmission, but most Fits will arrive at dealerships with a continuously variable transmission (CVT) that maximizes fuel efficiency, up to EPA ratings of 33 mpg city, 41 highway, 36 combined—which vaults Honda to the head of a class that includes the Chevrolet Sonic, Hyundai Accent, Nissan Versa, and Toyota Yaris. In a separate Sport mode, you can slick through seven "gears" with paddle-shifters, if you'd like. Honda's done a better job of making the CVT tolerable than Nissan does, although we still find Subaru's CVTs the best among small cars. At speeds well above any U.S. speed limit, the Fit manages to suppress most exterior noise fairly well. It's hardly the hush of a luxury car, but among small and affordable hatchbacks, the new Fit is noticeably more refined than its predecessor was. If only Honda had paid a little more attention to engine noise, it would have been even better, as this Fit, with its new direct injection and composite intake, can sound a little raspy and uncouth. The Fit rides with a little more maturity than it has in the past, and keeps its responsive steering and handling, but the cost is that the driving experience isn't quite as tied to the driver's seat. One of the keys to the Fit's simply unparalleled interior flexibility is its so-called "Magic Seat" rear-seat setup. The setup brings a split folding rear seat that can not only flip forward, but also flip back and upward, allowing four different modes that cater to specific kinds of large cargo—including a unique Tall mode and a futon-like Refresh mode. Back seats are happy places for tall, lanky folks, too—more so than in many swoopy-roofline cars a size or two larger. In front, the Fit is more ordinary for its class. Seat cushioning and support covers only the basics—even relative to other models in this segment—and some will wish for more rearward seat travel and adjustability. 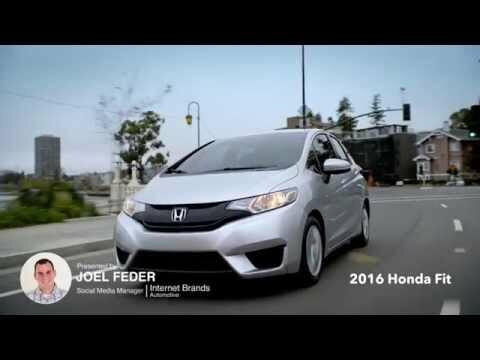 Honda's 2016 Fit has earned very good safety scores from both the IIHS and the NHTSA. The NHTSA gives it five stars overall, and the Fit achieved "Good" ratings in all IIHS categories except the tough new small-overlap front crash tests, where it was rated "Acceptable." The 2016 Honda Fit now essentially includes four models and primary builds: a base Fit LX, a mid-range EX, and a premium EX-L. Keyless entry, cruise control, a rearview camera, and air conditioning are among many items now included even on the base LX, while mid-level EX models get push-button start, upgraded infotainment, and Honda's impressive LaneWatch wide-angle lane-change aid from the Accord. The Fit EX-L heaps on leather and more luxury, while a navigation trim level finally gets a system worth the premium, with a high-contrast display and live traffic data. The 2016 Honda Fit has a taut, trim body, but some interior trim disappoints. The third generation of the Honda Fit might be its most attractive, polished version yet. It's a crisper-looking hatchback, with more aerodynamic lines than before, with the usual open, airy-feeling cabin. The only letdowns, really, are some of the trim that looks inexpensive, even for a $16,000 hatchback. Pragmatic but attractive, the Honda Fit looks less like a scaled-down minivan these days. The stance is leaner and more shapely, thanks to a deep crease that underscores the side of the Fit, emphasizing its length and the upward rise of the window line. With a steeply raked windshield at virtually the same angle as the short, stubby hood, the crease adds motion and a horizontal appearance to a tall, almost "one-box" shape riding on fairly small wheels and tires. The new shape tapers both in height and width past the rear doors, ending in larger rear taillight units that continue up the sides of the rear hatch in rear styling that's quite Volvo-like—if only it weren't for the big chrome bar across the tail. While the exterior is nicely restrained, designers were perhaps a little too ambitious inside, where the instrument panel has a little too much happening with shapes, pieces, trims, bezels, and surfaces. It's a nice cockpit-like layout, though, and doesn't feel low-rent—though the many cutlines and textures look more thrifty than the nicer pieces in the HR-V, a new crossover derived from the Fit. The Honda Fit drives with a responsive, well-coordinated feel, but it's a little less eager than before. The current version of the Honda Fit doesn't capture the same precise feel and entertaining road manners of past versions, but it makes up for that loss with stronger acceleration and better fuel economy. The Fit draws its power from a new 1.5-liter inline-4. Rated at 130 horsepower, with 114 pound-feet of torque, it's up considerably over the prior car, thanks to new features such as direct injection and lighter-weight parts like the crankshaft and intake manifold. Today's Fit has also changed transmissions. Honda now offers a 6-speed manual transmission with a lovely shift-lever action and the usual transparent Honda clutch uptake. The linkage is shorter, smoother, and more precise—better than most you'll find in affordable small cars, really. But you don't get any deeper overdrive with the added gear; its top sixth gear is now roughly aligned with what had been fifth gear. Far more common will be the more fuel-efficient continuously variable transmission. Honda says it's worked to improve the responsiveness from the continuously variable transmission (CVT), which we think they've accomplished. As in the current Accord, the Fit's CVT drives well. Since it's always modulating its gear ratio, it moves quickly through the powerband, without surge or shift shock. There's also a Sport mode, for Fits equipped with shift paddles. They let the driver click through seven preset simulated gears—or you can grab the left paddle-shifter in Drive for more revs and responsiveness, for a short time. Push the Fit just a little more and it's not quite as pleasant. The engine is in its sweet spot for acceleration around 4,000 rpm (peak torque arrives at 4,600 rpm). There's not much more acceleration remaining—mainly just extra noise—when you push the accelerator beyond about 70 percent of its travel, as the engine hits its upper ranges and reveals the rather thin firewall insulation. 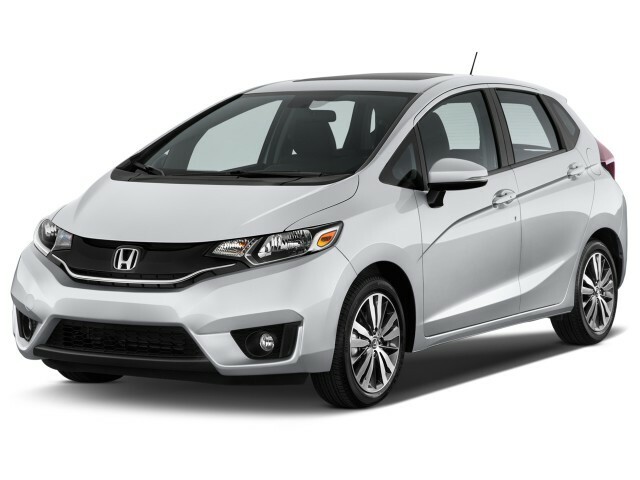 For 2015, Honda re-engineered the Fit's front suspension, giving it a new geometry with front struts, a larger (hollow) stabilizer bar, a new lightweight subframe, and more caster trail for stability. In back, there's an H-type torsion-beam setup with shorter trailing arms than before, plus input-separation damper mounts (helping to isolate major road shocks without any loss in control). That translates out of engineer-speak into a well-controlled ride that does a better job of damping the road than previous Fits. It also has more body lean and a slightly less precise feel through its electric power steering. The system in the new Fit is column-mounted—typically a less-desirable arrangement for precision—but it feels responsive enough, and reasonably well-weighted here. There's a fair amount of brake dive, although the pedal is also precise and easy to mete out. The Magic Seat puts the Honda Fit head and shoulders above other hatchbacks; it could use better plastic trim and more sound deadening. The Honda Fit may be small on the outside, and it may have more than its fair share of shiny black plastic trim—but what it does with its passenger and cargo space is unrivaled. The Fit is packaged better than any small hatchback we've driven. It's the magic of the Magic Seat, a simple system in which the rear bench seat of the Fit can flip up to open a tall, useful cargo space behind the front seats—while leaving a cargo bin inside the hatchback, too. There's a "tall" mode that locks the bottom cushion into a vertical place: toting home tall objects doesn't require renting a truck or leaning on a friend who has one. "Long" mode allows the Fit's rear and front passenger seats to lay nearly flat, opening up a long space that can carry a surfboard or a ladder. "Refresh" mode tilts back the rear seat backrests for better long-distance comfort. It works quickly, and brilliantly, to free up space otherwise trapped under and behind the Fit's seats. 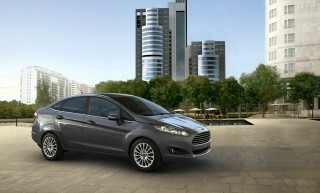 The utility is the Fit's hidden strength, but it's also quite comfortable for passengers. You might actually fit better in the Fit than you do in some "larger" small cars; our tallest editors can sit in the Fit with just enough leg room and head room to be comfortable—something they can't do in the Civic. Thanks to tall, full door cutlines, getting in and out of the back seat is easy and they are reasonably comfortable, even though you can see that foam and structure were kept thin by the design constraints of the trick folding arrangement. It's because of that phenomenally good seat-folding arrangement—and the excellent back-seat space—that the Fit scores so well in comfort and utility. But it's not without its flaws elsewhere, and those flaws drag it down in overall quality. In front, the Fit is more ordinary for its class. Seat cushioning and support covers only the basics—even relative to other models in this segment—and taller passengers will find it can stand more rearward seat travel. The odd, angled curvature of the floor on the passenger side creates a fatiguing, skewed-leg position. As far as refinement and noise go, the Fit is a mixed bag. We noticed some persistent wind noise at the side mirrors, as well as at the windshield and cowl; new underbody aerodynamic panels help fuel economy, but don't much impact interior noise levels. Although there's relatively little road roar and rumble compared to other cars in this class. One letdown, though, is that in this day of piped induction noises, tuned intake manifolds, and exhaust resonators, the Fit's engine sounds coarse and unrefined—and you do hear it quite a bit if you're accelerating rapidly or climbing a long grade. The Fit has some of the best crash-test scores of any subcompact hatchback. When Honda first introduced the latest Fit, its crash-test scores came in lower than expected. A quick fix was put into place during the 2015 model year— the results make the 2016 Fit one of the safest small hatchbacks available today. The NHTSA gives the Fit an overall rating of five stars, with five-star performance on all tests save for four stars in rollover resistance. The IIHS rates the Fit as "Good" on most tests, except its new small-overlap crash test. There, the Fit earns an "Acceptable" rating. 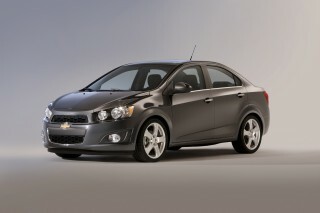 All Fit hatchbacks carry the requisite airbags and stability control. They also have hill-start assist and a standard rearview camera. The EX and EX-L Fit hatchbacks add the excellent LaneWatch display system, which takes a wide-angle rearward view from a camera on the rearview mirror and shows it on the infotainment screen the moment you flick the turn signal. We've found this feature to be tremendously useful in the Accord, where it made its debut, and it should be even more useful in the tight urban environment that the Fit is designed to tackle. We'd still like to see new features like blind-spot monitors make their way into the Fit, though—LaneWatch doesn't impart the same information as the useful peripheral blinks of a good blind-spot monitoring setup. While the Fit includes an impressive set of safety equipment, the fundamentals are decent, too, with good outward visibility, because of the high seating position and all the window space. The Fit has an impressive list of standard equipment, with logically packaged and priced luxury options—something Honda's not always offered in the past. With the Fit, Honda has one of the better-equipped hatchbacks for frugal buyers. If that seems contradictory, that's the state of the American car market—even shoppers looking at $16,000 hatchbacks want choices for premium audio, navigation, even leather seats. Honda sells the fit in three trim levels: LX, EX, and EX-L, the latter of which can be fitted with a navigation system. All Fits include power windows and locks; air conditioning; keyless entry; cruise control; a rearview camera; an AM/FM audio system with a USB port and Bleutooth with audio streaming. 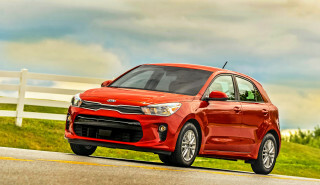 Base prices start at just below $16,000 for manual-equipped cars; the continuously variable transmission adds another $900 to the price tag. On the nearly $18,000 Honda Fit EX, standard features include keyless ignition; a right-side LaneWatch camera; another USB port; a 7.0-inch infotainment screen; a sunroof; and shift paddles. The EX-L gets heated front seats and leather; EX-Ls with navigation also add satellite and HD radio, as well as real-time traffic information. For those who care to add more and dress up their Fit, there's a whole line of dealer-installed accessories, including remote start, special machine-finish alloy wheels, a sport grille, various other appearance extras, and things like a cargo tray and cargo organizer. And to those who have found recent Honda audio and navigation systems to be utterly disappointing, better systems with good touchscreens and HondaLink smartphone connectivity have finally arrived. The base audio system includes a 5.0-inch screen with Bluetooth audio streaming, hands-free calling, voice recognition, dial by number, and a camera display. The step-up system, with or without navigation, includes a 7.0-inch electrostatic touchscreen and apps capability. We thought it sounded great and launched and streamed Pandora from our iPhone—loading album art and track information—with no fuss or need for input. Aside from hybrid vehicles, the Honda Fit is one of the most fuel-efficient hatchbacks on the road. A good compact sedan will score higher EPA fuel economy ratings, but the 2016 Honda Fit earns some of the top EPA gas-mileage ratings among subcompact hatchbacks. 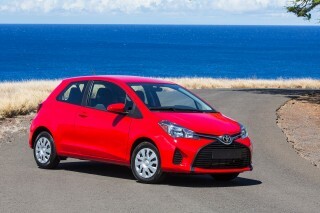 The EPA rates the Fit at its lowest in versions with the manual transmission. The combination of the 4-cylinder engine and the 6-speed gearbox is pegged at 29 mpg city, 37 highway, 32 combined, whether it's the LX or EX model. Part of that is due to the reason that Honda decided to go with lower gear ratios for the most part for the manual, thinking that it will be the choice for driving enthusiasts, not frugal types. We don't necessarily agree with this, and we think that it limits the manual's appeal. The manual is now a 6-speed, but Honda has, for instance, decided to go with a top ratio that's about the same, maybe slightly lower, than last year's fifth gear. That results in the engine spinning nearly 4,000 rpm at 80 mph. With the continuously variable transmission (CVT), the Fit's fuel economy is several miles per gallon better. It's rated at 33/41/36 mpg combined in LX trim; because of added equipment and weight, EX and EX-L models are rated at 32/38/35 mpg. At 80 mph, the CVT is turning at well below 3,000 rpm. In either case, real-world mileage has been impressive in our experience over a couple of drives in the Fit. Honda's reputation for conservatively assigning its EPA fuel economy numbers is well deserved. Over more than 75 miles of driving that we'd describe as spirited—along rapid two-lane highways and expressways—we saw an indicated 37-mpg average.